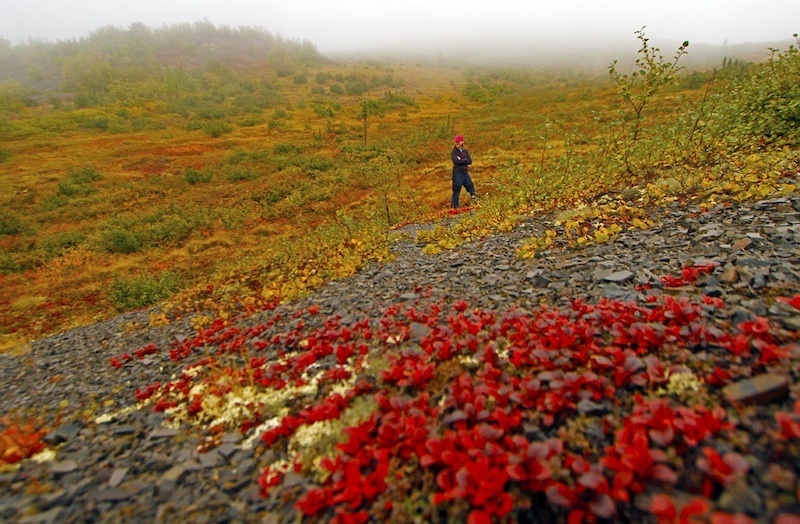 The Yukon is a Canadian territory located north of sixty degrees latitude. Only about 35,000 people inhabit an area a bit larger than the state of California or, twice the size of the UK. 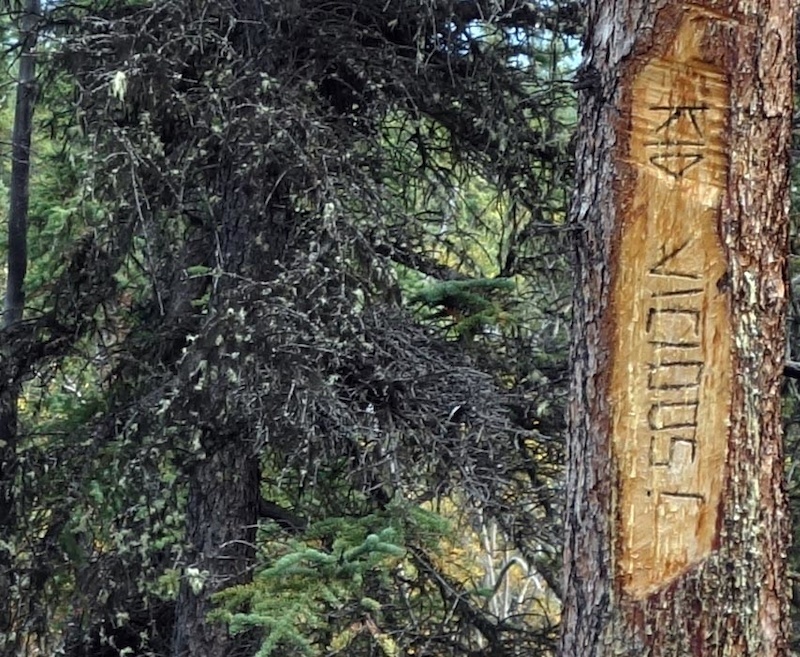 It’s safe to say that Yukoners are very outdoorsy people who keep close with nature. The city of Whitehorse is home to 27,000 out of the 35,000 Yukon residents, which leaves the rest of the territory sparsely populated indeed. Approximately 75% of city residents use trails on a regular basis, for hiking, biking, snowshoeing, ski-joring, and running. The local bike club boasts 300 members, a huge club for a city of any size, let alone a town the size of Marshalltown, Iowa. 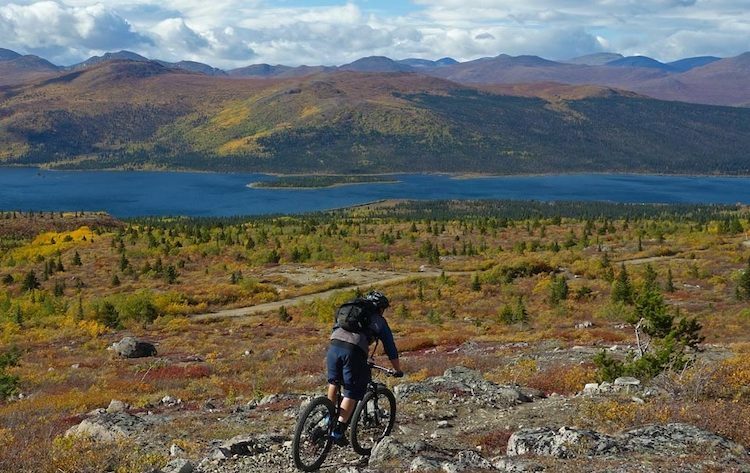 There are 700km of trails in the Whitehorse area, an insane amount given the size of the city. 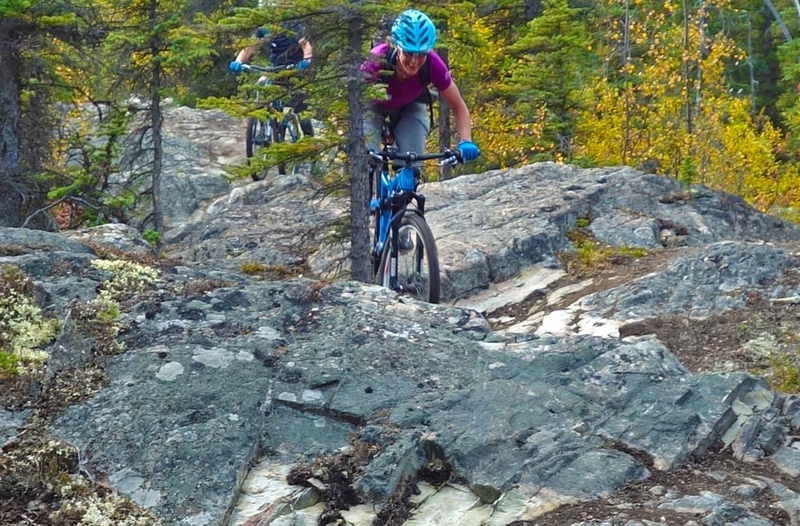 Whitehorse clearly recognizes the value of trails, sponsoring a dedicated trail maintenance crew for many years running. We were entertained by the Northern Lights. 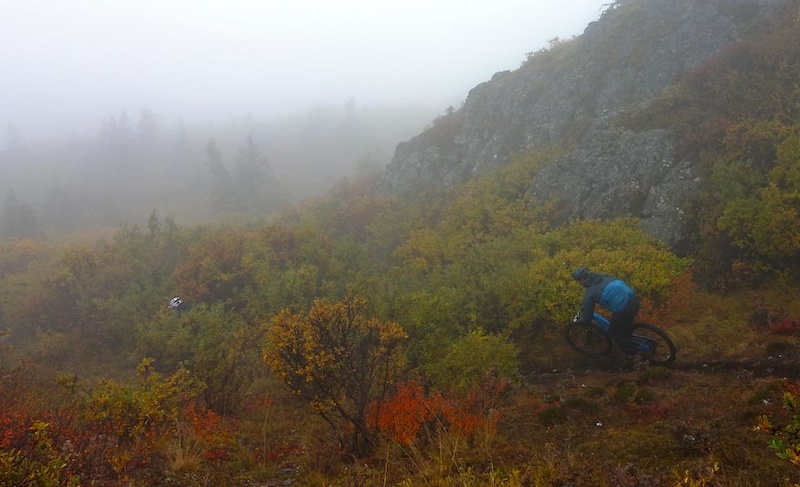 Canadians tend to volunteer their time building and maintaining trails, and Yukoners are no exception. 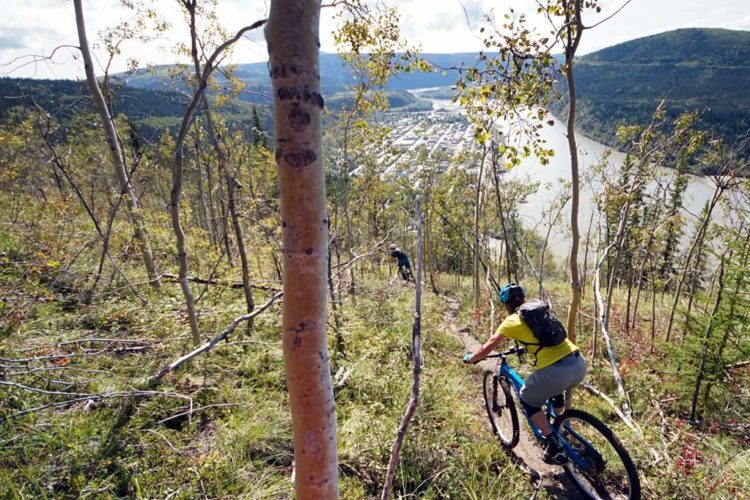 There are a lot of people who are active, and the quality and diversity of the trails around Whitehorse show the results. This trail scene has been developing for over 20 years! 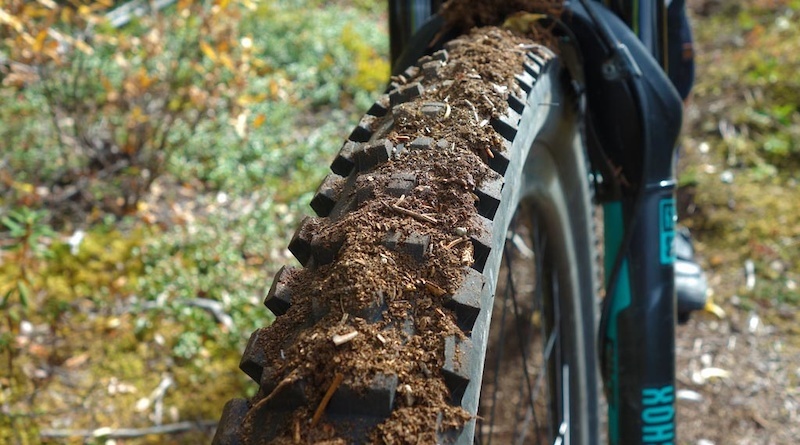 Riders can show their appreciation for the local trails by checking out the Contagious Mountain Biking Club page and donating or volunteering time. 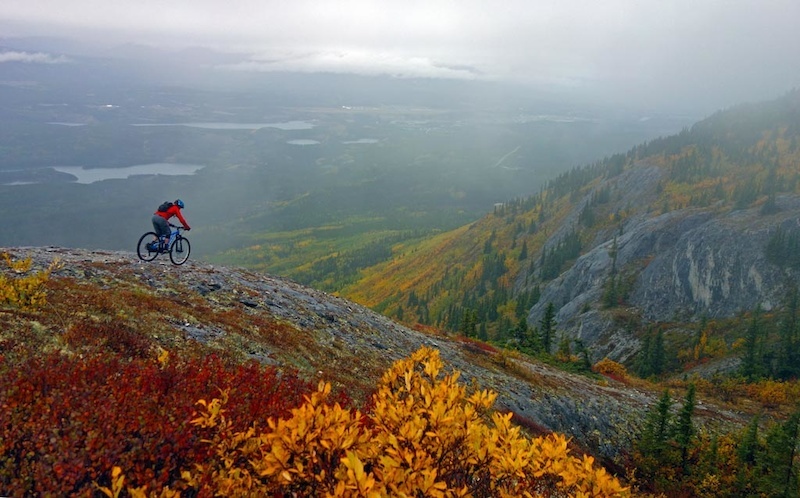 The city of Whitehorse gets the least amount of rain of any Canadian city, with a near-desert climate. The rolling hills feature soil composed of glacial silt blown in on westerly winds, giving the ground excellent moisture absorbing capabilities. 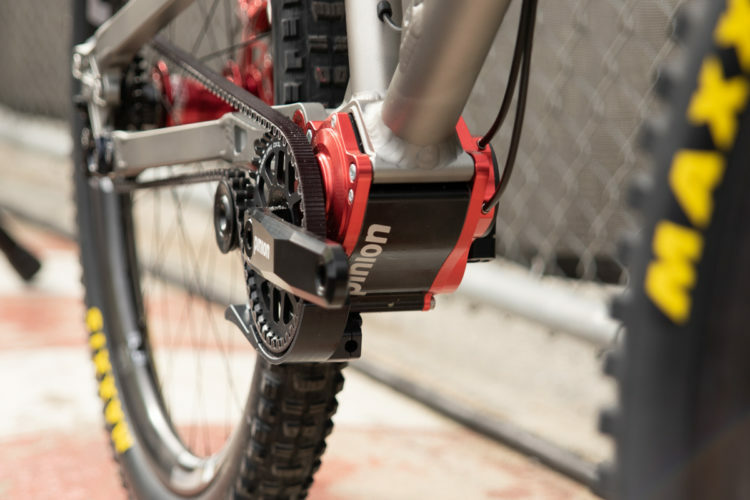 This all contributes to trail surfaces that are basically perfect for creating singletrack heaven. 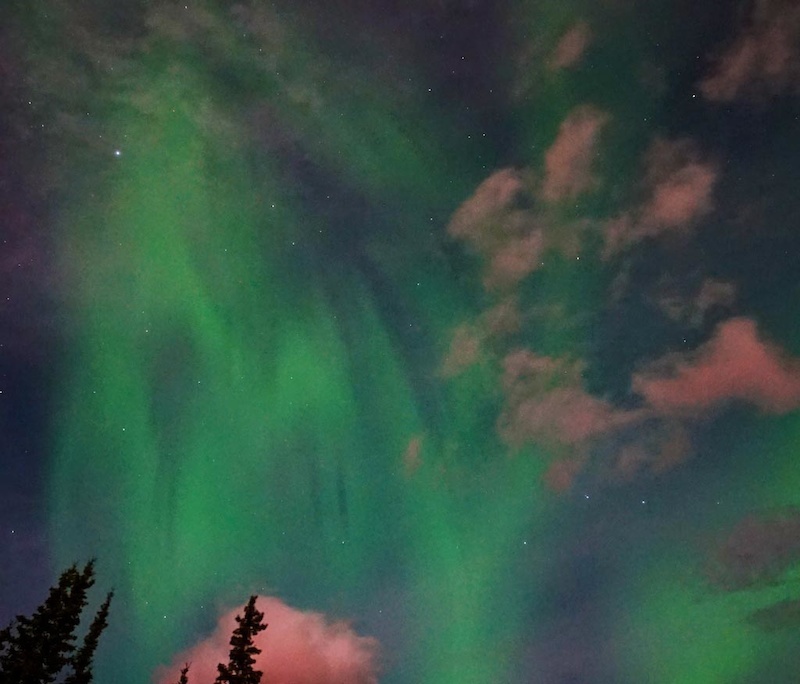 Whitehorse is a 2-hour plane flight north of Vancouver, which is a little more time than the drive on the Sea-to-Sky highway from the Vancouver airport to Whistler. 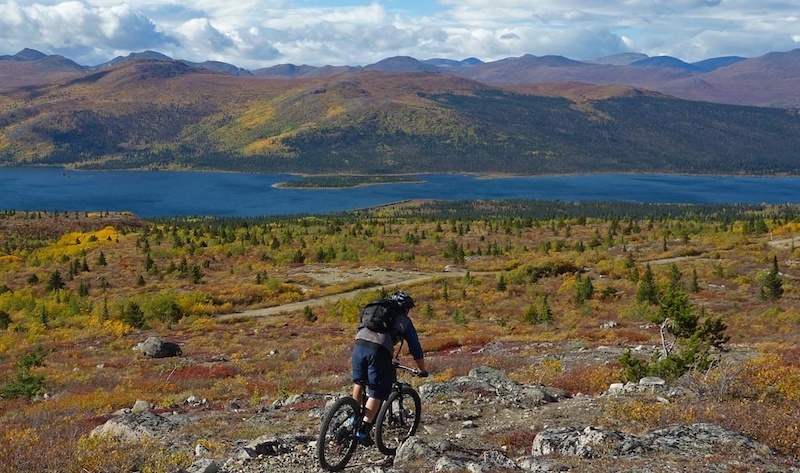 For all those who wish to visit Canada and only think of Whistler and the Rockies, consider the Yukon. Our two-hour flight on Air North was effortless. It’s nice coming into a small airport where you walk off the plane, get your luggage, rent a car, and leave within 30 minutes. 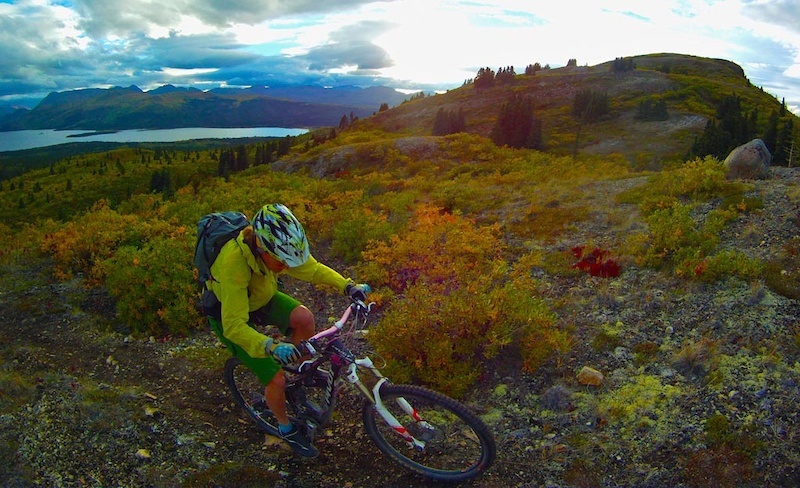 Whitehorse has two primary riding areas: Mt. MacIntyre and Grey Mountain. 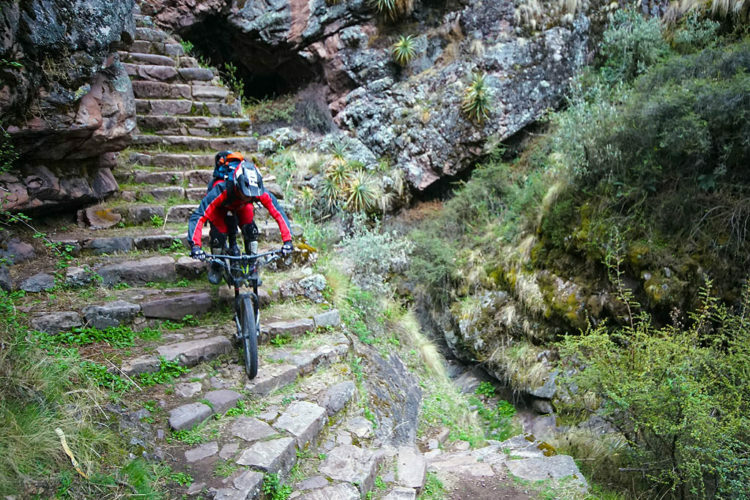 The riding is mostly of the pedally, trail variety with fast, wide-open, zoom-zoom trails but with amazing sight lines. 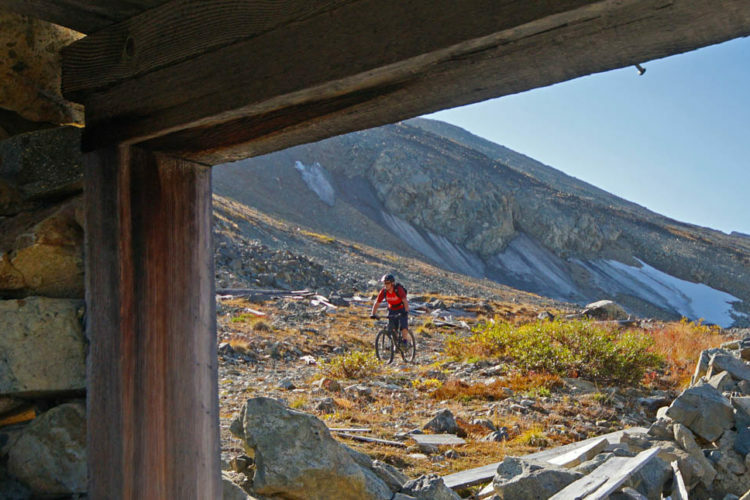 The trails include old mining access trails, hiking trails, and recently constructed mountain-bike-specific trails. 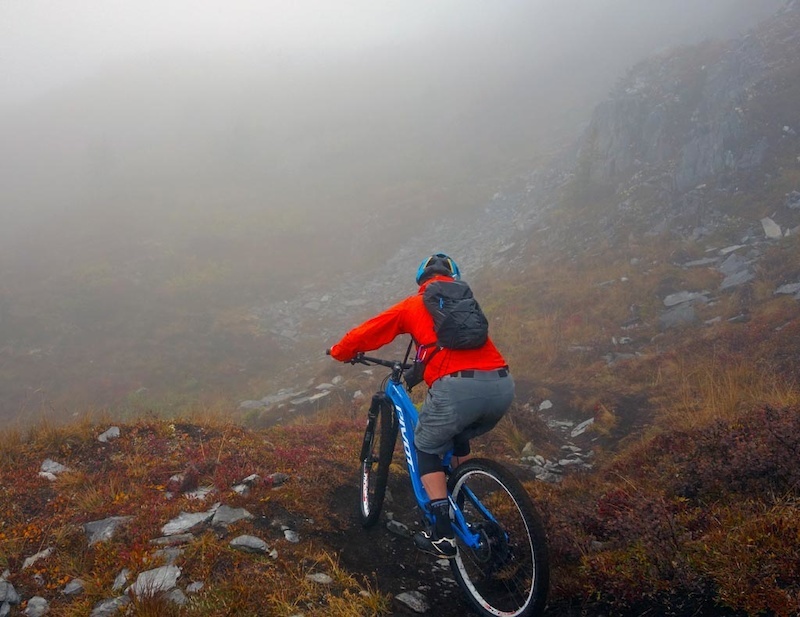 The Whitehorse mountain biking season runs from May to October, and the core of the riding season (June to August) has long daylight hours stretching well into the night. 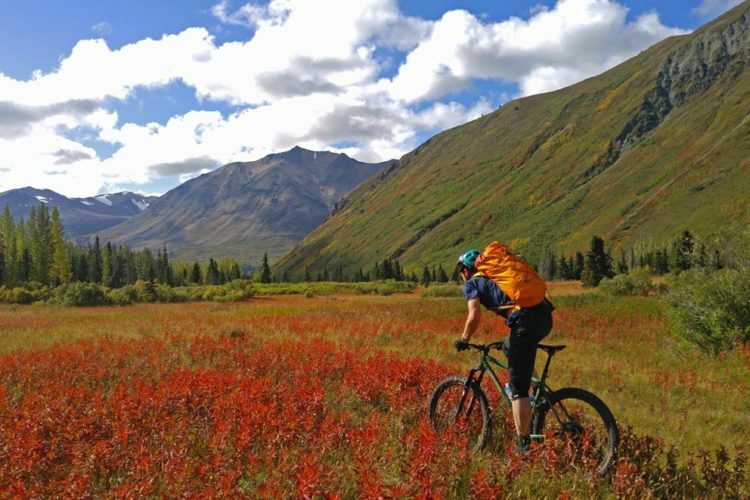 Temperatures tend to start dropping at night in September, which means bugs are dead and you’ll be guaranteed vivid fall colors. 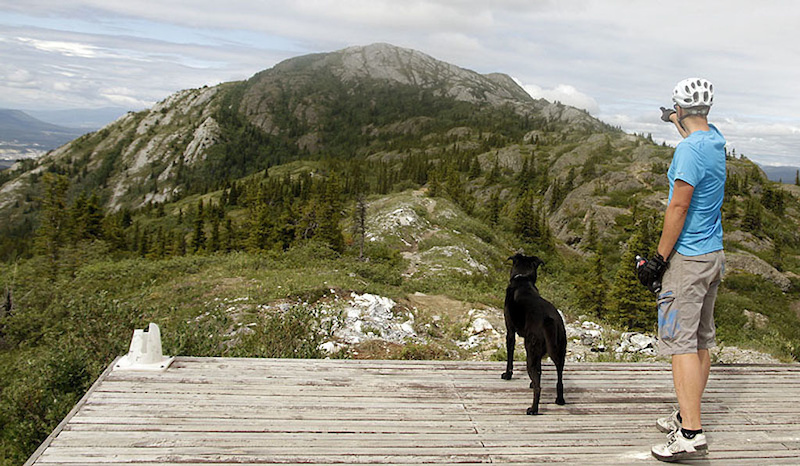 Basically an early September visit to Whitehorse is going to be good times. The Mt. Mac biking area is located just north of town. There are many trails here in the cross-country ski area and its surroundings, more than can be explored in just one ride. 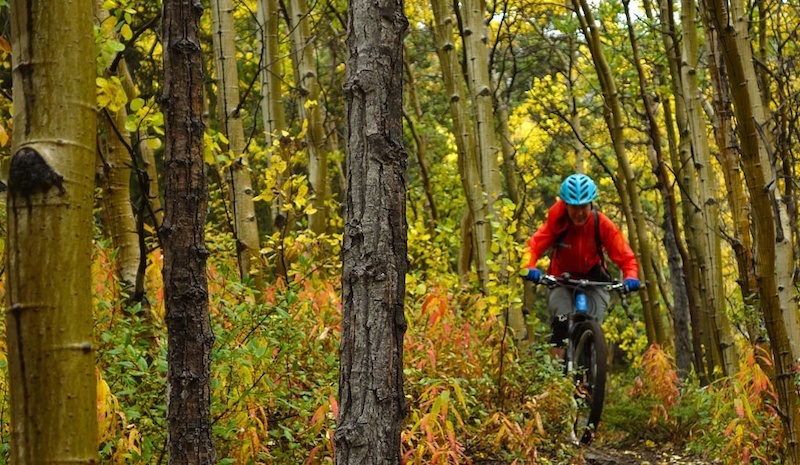 This area also hosts fat biking in the winter via a huge network of XC ski trails. We sampled Mt. 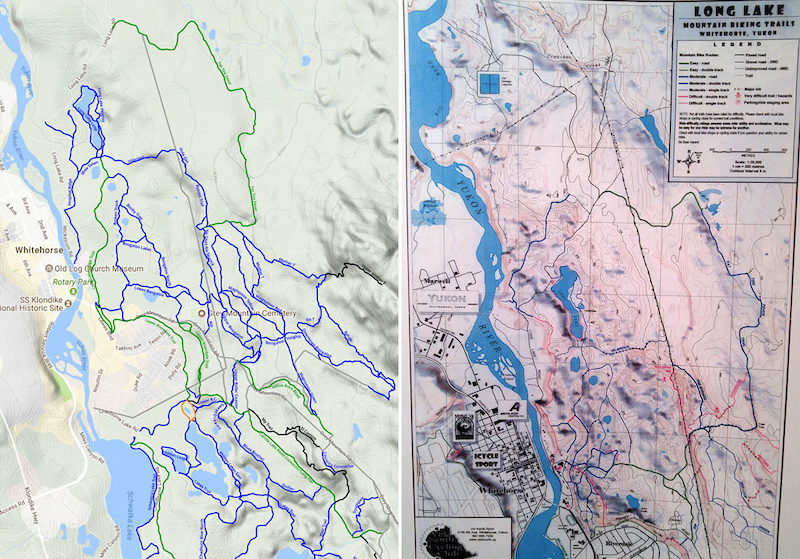 Mac’s alpine area, riding from the city environs at 800m (2600′) to 1400m (4,600′) where tree line drops away. 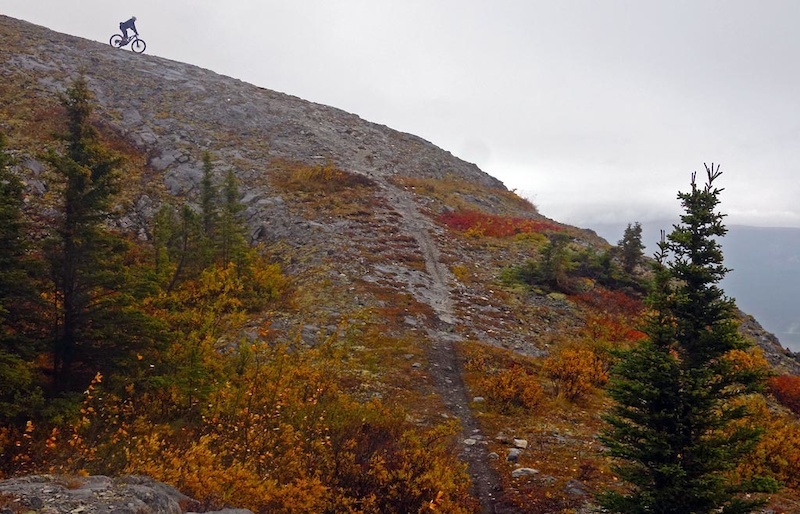 This 600m (2,000′) climb tracks along 4×4 and ATV trails, so it’s fairly easy to accomplish. 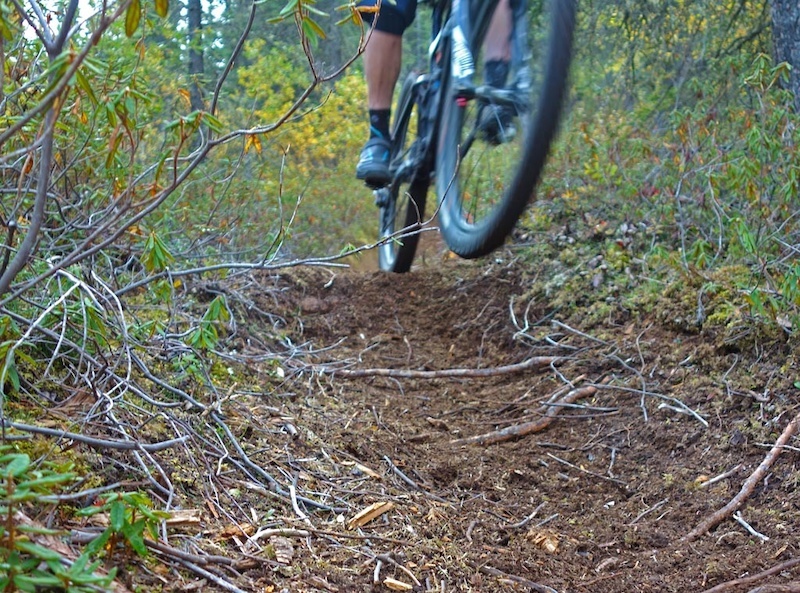 Our ride included trails like Blown Away, Starbuck’s Revenge, Goat, and Kid Vicious. We go up with distracting views. 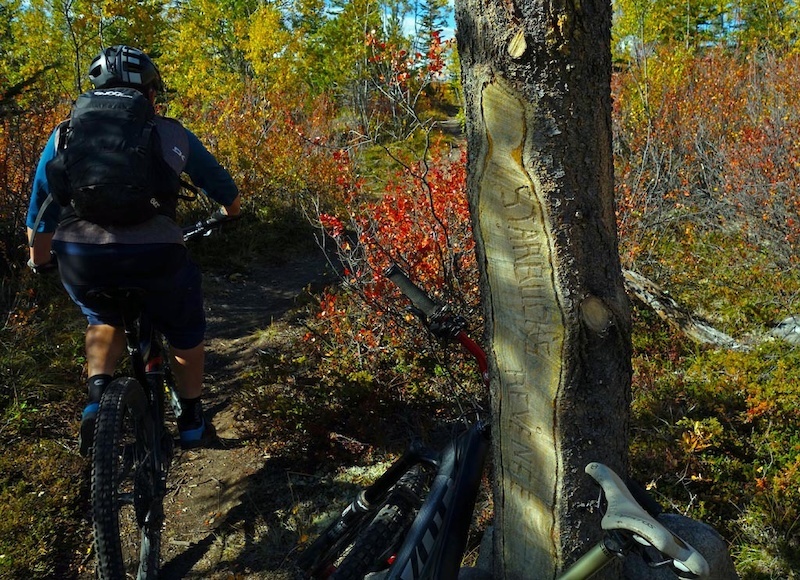 The trail network is well signed thanks to the City of Whitehorse and Yukon Territory grants under the auspices of the CMBC. Steve Reidles the Brit expat, Whistler expat, and now Whitehorse local, leading out on Blown Away. Shar on the Blown Away descent. Cool Signage! The twisty, turny Starbuck’s Revenge. A short climb with massive views. 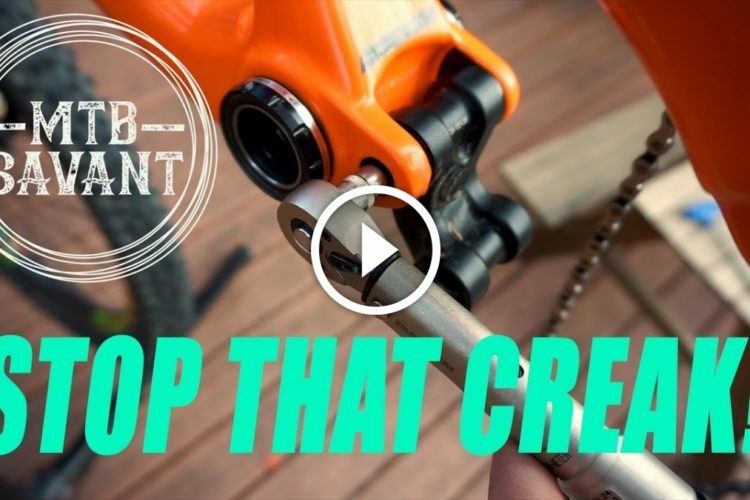 The ridiculously loamy descent of Goat and Starbuck’s Revenge, featuring two of the key builders, Anthony and Alex. 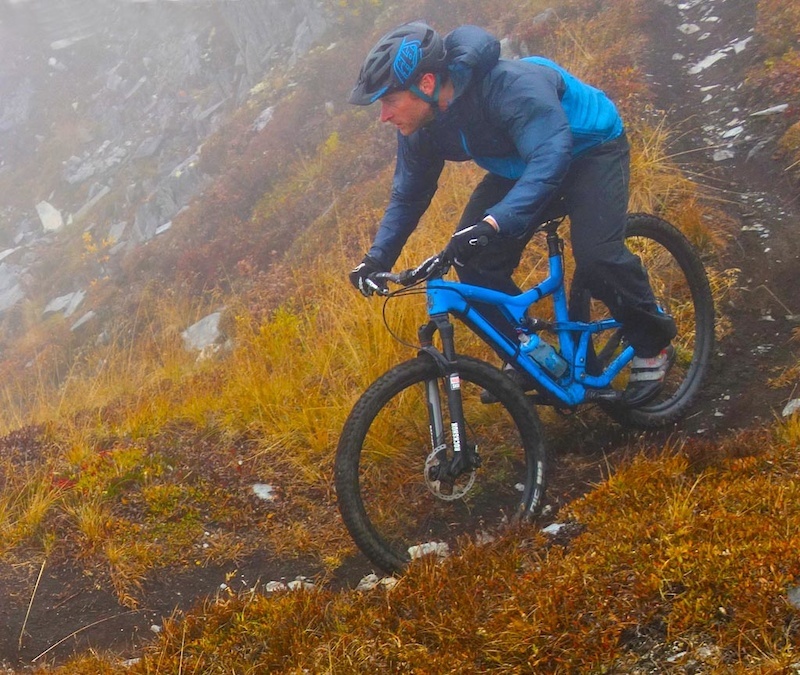 Kid Vicious is a newer, more technical trail and the brainchild of Paul Burbidge. Entry exam to the Kid can be dropped to flat if that’s your thing. 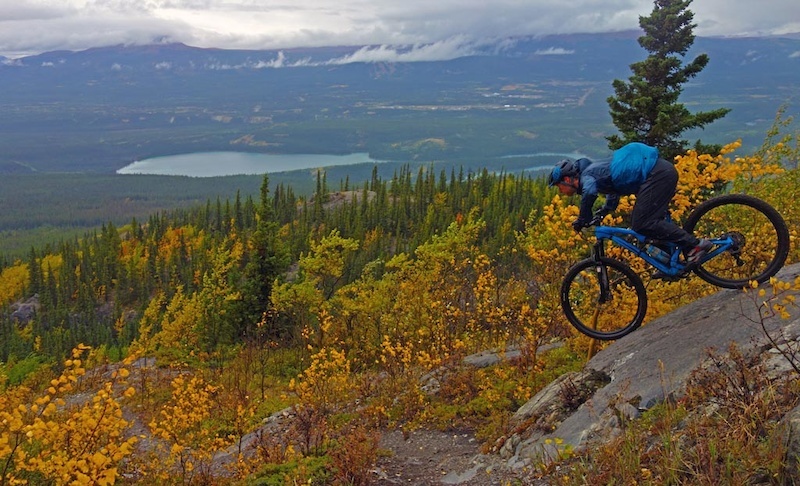 Mt Mac, Whitehorse mountain-biking; Kid Vicious from Lee Lau on Vimeo. 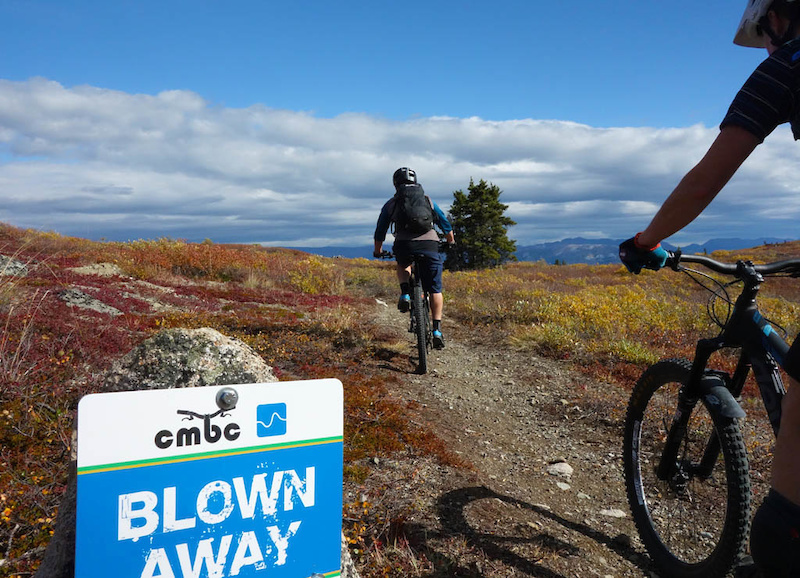 There are many combinations to ride within the Grey Mountain trail system, so I suggest either getting a guide from Boreale Explorers or finding someone to ride with via the CMBC Facebook Group. 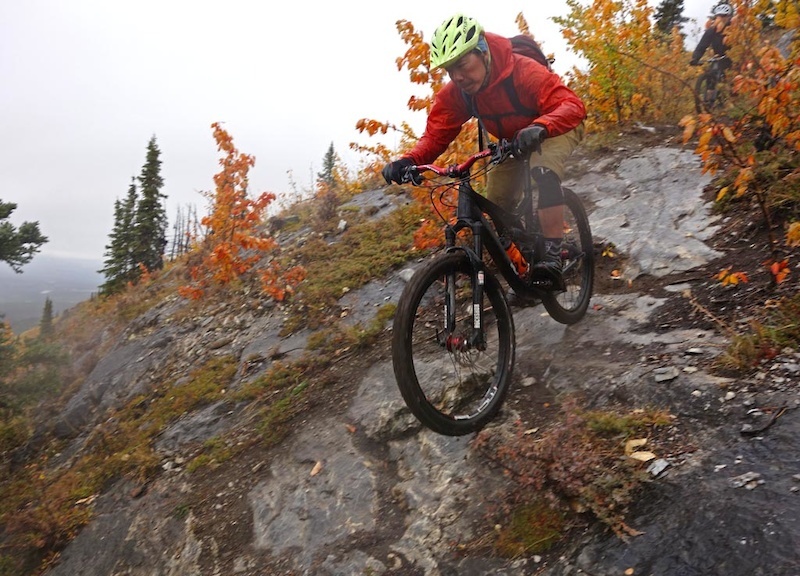 We rode Moneyshot, which is one of the older trails in the area and a tech fest dropping off Grey Mountain to the more enduro-goggle-friendly, zoom-zoom trails of the lower mountain. Grey Mountain is 1450m (7,750′) high, and with town at 600m (2,000′), however you slice it, there is ample elevation to play with. New and Old map of Grey Mountain. The system has been infilled over the past decade. Photo from our ride in 2011 with Tony DeLorenzo and Starbuck the dog on a day when we could see the views. We go up that ridge to the start of the trail. 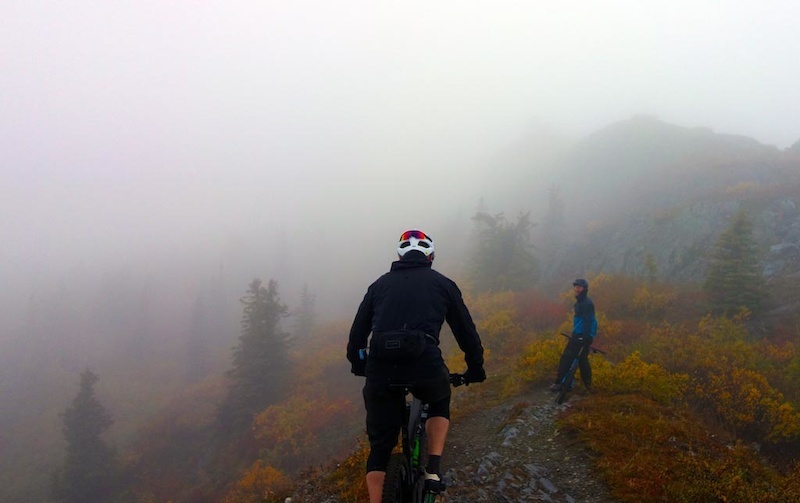 Into the mist as we start our ride. 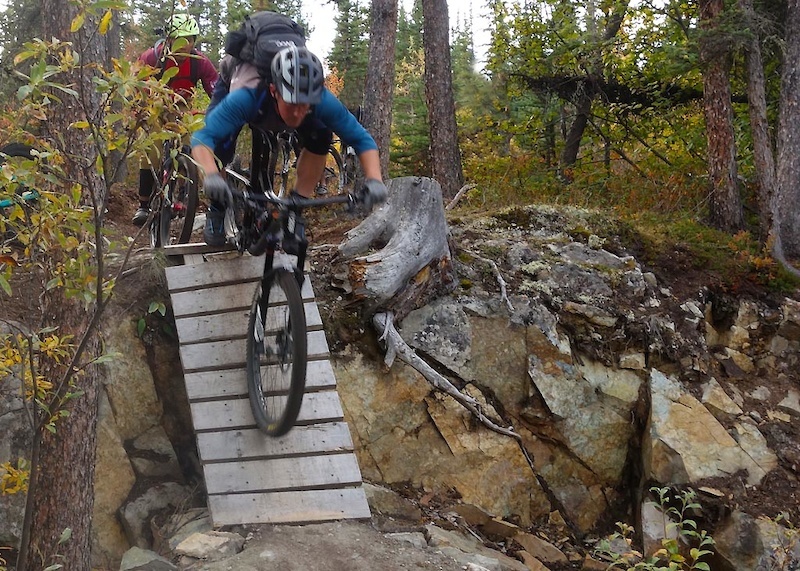 Paul Burbidge is one of the most prolific Whitehorse trail builders. It’s always a joy riding with him when we get into town. Sharon dropping into the mist. And down to the valley. 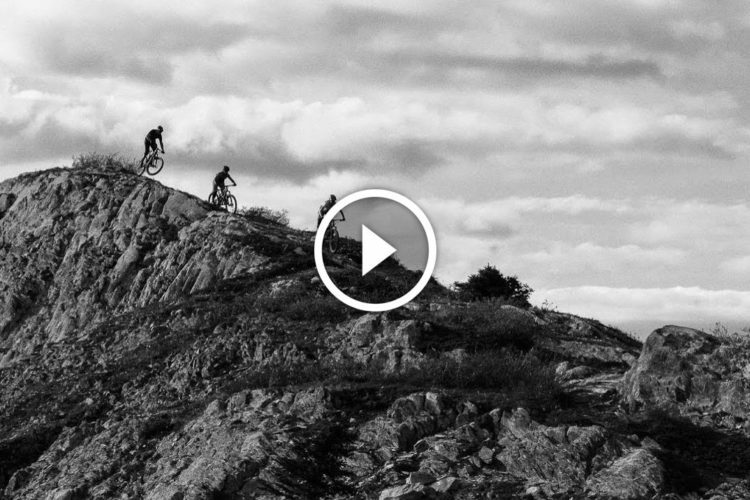 Grey Mountain – Moneyshot from Lee Lau on Vimeo. 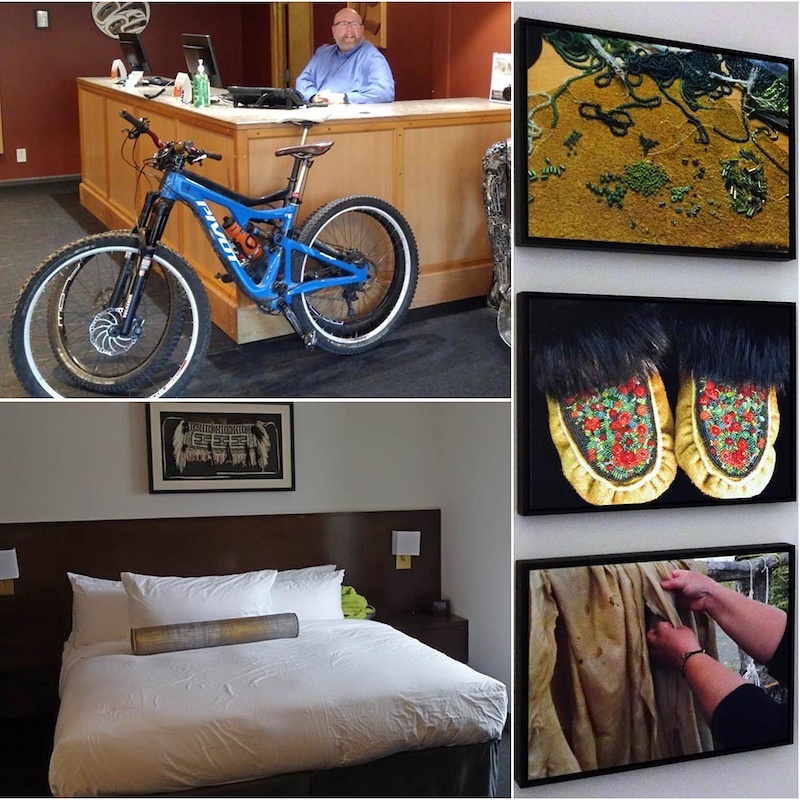 While in Whitehorse we stayed at the Edgewater Hotel right downtown. 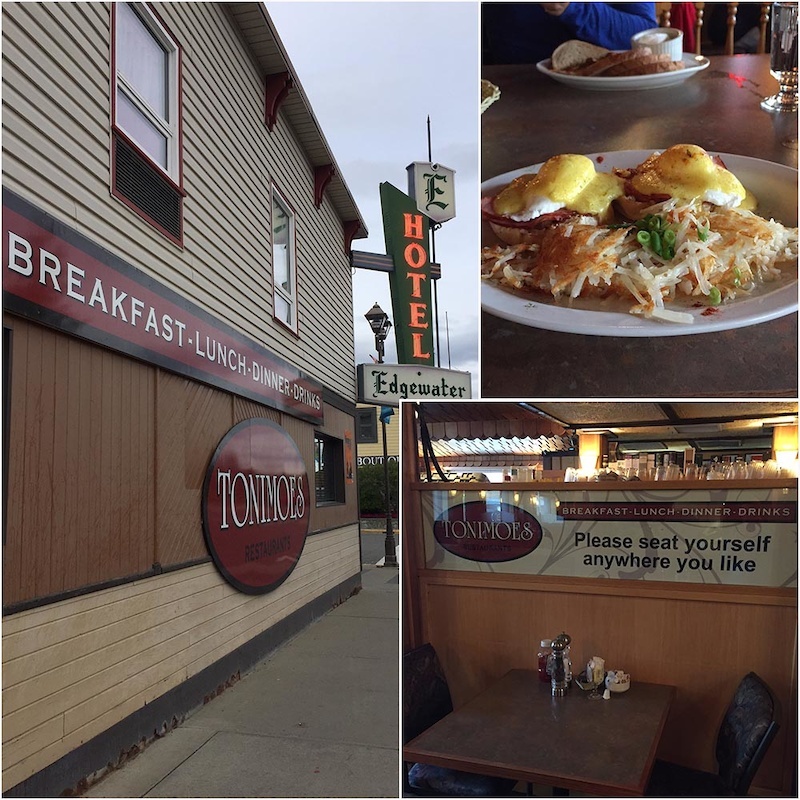 This hotel is centrally located, has great friendly service, new comfortable rooms with art from local Indigenous artists, and an attached breakfast restaurant called Tonimoes. Our comfy, convenient accommodations while in Whitehorse. Tonimoes also has a stellar Happy Hour with 50% off appies! 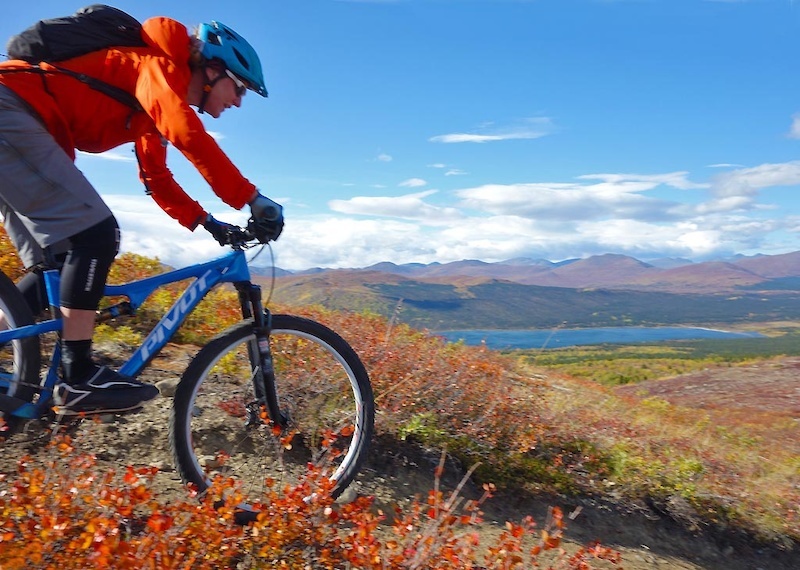 This is part 3 in a series on mountain biking in the Yukon. Go back and catch up with Part 1 and Part 2.